After finishing our Laura Numeroff author study in December, the kindergartners started our Mo Willems author study. 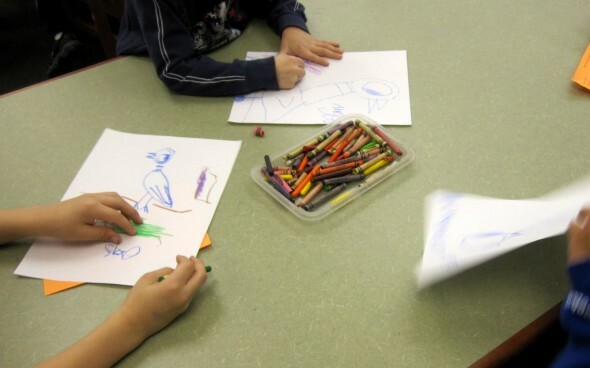 We always learn how to draw the Pigeon after reading the books. We usually do Dr. Seuss first (to lead up to Dr. Seuss Day on March 2nd) and Mo Willems after that, but I couldn’t leave this one for the sub. The first graders are all finished with Clementine! That’s pretty much on track with my normal school year, so lots of them have started trying out chapter books now that we’re halfway through first grade. And this week I’m starting our Caldecott unit with them. I’m tackling a year a week in February, starting with some of the 2009 books first. Then we’ll end with the 2012 Caldecott books, which I hope to get my hands on by then. I haven’t even posted about this year’s Youth Media Awards yet, and I don’t know if I will. I feel so out of sync with children’s literature this year, and the books I’d hoped to see get the Newbery didn’t even get honors. Two of the Caldecott books I haven’t even read. So I’m feeling a little disconnected from this unit this year, like I’m not obsessed with sharing the 2012 books yet like I usually am each year. We’ll see if that changes. The second graders are also almost finished with The Miraculous Journey of Edward Tulane. I started that much earlier this year, and we’ll be done with the reading in 2 weeks. I won’t have time to do book reviews like I did last year, so I’m scouting out some other activities to cap off that unit. This week we’re reading through chapter 19, the saddest part of the entire book. So it’s been a multi-hanky kind of week in 2nd grade. 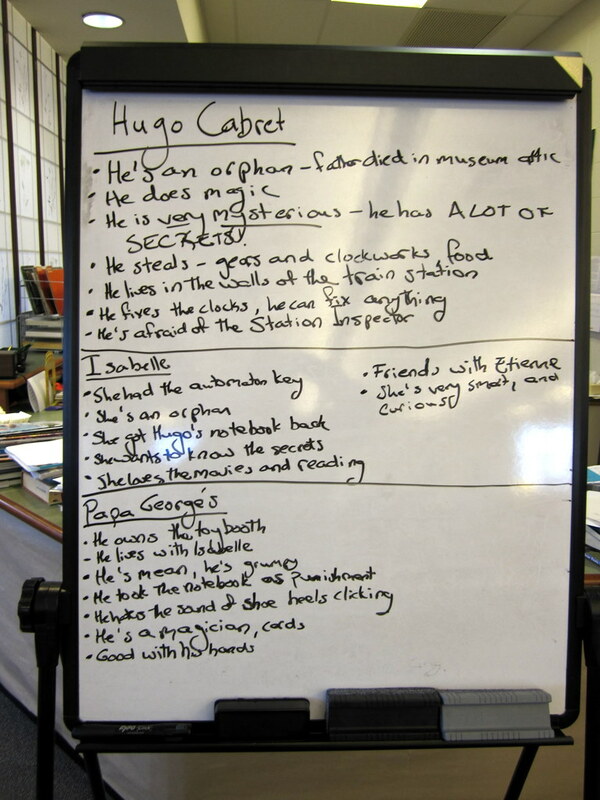 The 3rd graders are also 2 weeks away from finishing The Invention of Hugo Cabret, which I thoroughly can’t believe. I’m so used to finishing this book at the end of the year and then spending the last few weeks of school doing fun follow-up activities. To have it end in February is just bizarre. We’ve had our literacy circles and done our character map for the book, and next week we’ll watch the video I filmed in Paris. Then my last week before maternity leave we’ll watch the silent films. They are hooked on this book, like they are every year. I bought 6 copies of Brian Selznick’s Wonderstruck, and I cannot keep them on the shelves for 3rd or 4th graders. This is by far my favorite novel that we read in library class, so I’m thrilled to finish this with them before I go. Knock on wood that I don’t go early, I’ll be devastated! And then we have the 4th graders. They’re just all over the place in library class, they are definitely the grade I’ve struggled with the most over this maternity leave. I won’t get anywhere near finishing my favorite activities with them. Battle of the Books was last Friday, and it was absolutely epic. I struggled with that program last year, but this year I took it over solo and ran it completely during library class. This worked out perfectly, and instead of having the teams created across the 4th grade like my school used to do I kept the teams to within the same homerooms. Then homeroom teams battled against each other during their library class time, and the best team from each homeroom went on to the final last week in front of half the school. Every 4th grade class picked a class color to wear for the final, and they cheered like crazy for their classmates. I played “Eye of the Tiger” over the PA system as the competitors made their grand entrances. We had lots of tears, a huge upset in the final round after a tie-breaker question. It was like my Olympics, and I’m thrilled with the changes I was able to make. But because I had to squeeze in the program before I leave (the final battle is usually the week before spring break), it cut out a lot of class time for the other library things we do. The whole month of January was spent on the in-class battles, plus the time spent since Halloween book talking, organizing teams and permission slips, troubleshooting. I started The Maze of Bones at the beginning of October this year, instead of early December like last year. But we’re still not halfway through, and we won’t be before I leave. We’ve had lots of technology hiccups in the library lab this year, so on top of having Battle of the Books during library class when it used to be during recess (which really didn’t work at all) and leaving in March to have this baby, the computers died on me every time I tried all the technology tie-ins and games I did with the 4th graders last year. Last year I arranged for the 4th graders to get school email accounts, I set them all up with accounts on 39clues.com, we talked about cyber ethics and etiquette, we played a bunch of reference games. I haven’t done any of those things this year, and I’m really disappointed about that. So I hope my sub jumps in with this book and really comes up with some great activities for them the rest of the year. And I hope next year I smooth out all the kinks with Battle of the Books and the library lab so we can really get down to business in 4th grade. On top of all that, we’re working on updating the library curriculum in my district. The librarians had a lengthy curriculum meeting yesterday, and guess what they surprised me with? 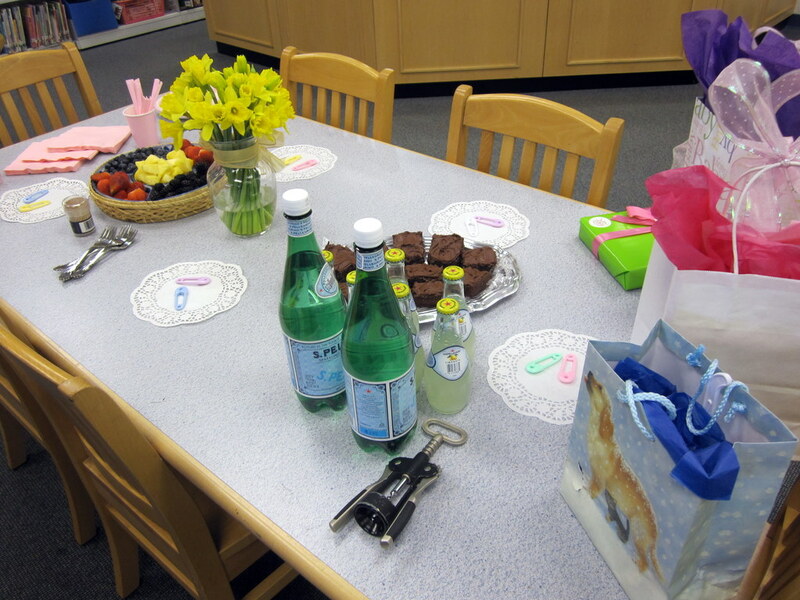 A baby shower! With brownies and books and this onesie (librarians do have excellent senses of humor). 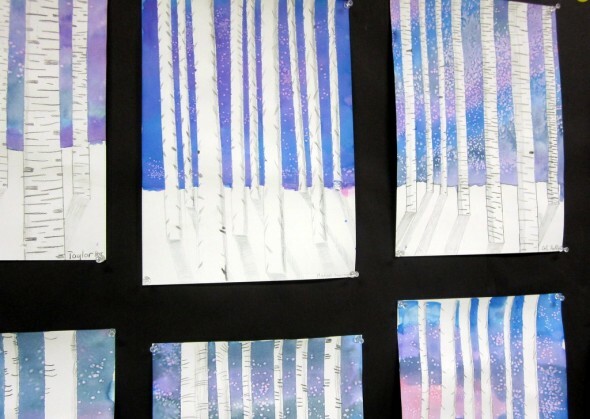 AND, check out this project the art teacher did with the 3rd and 4th graders. They remind me so much of the cover of this book, still the only book I have read so far in 2012 (#librarianfail #pregnancybrain). It makes me happy every time I walk past this bulletin board in the hall. My last day is 4 weeks from this Friday. Then a week after that H is due. I can’t believe how down to the wire it’s getting.